Craig Brown believes Aberdeen manager Derek McInnes is "better than Sunderland" and it would take "an exceptional club" to tempt him away. McInnes elected to stay with the Dons despite holding talks with the club relegated from the Premier League. His decision has "delighted" Brown, who is still an Aberdeen director. "It would have to be an exceptional club before Derek would be tempted to go down south and have another interview," he told BBC Scotland. "Sunderland was a unique situation, the Scottish connection may have been the reason that Derek went down. "I genuinely believe that he's better than Sunderland and that he can get a fine job in the Premier League in England in the fullness of time." 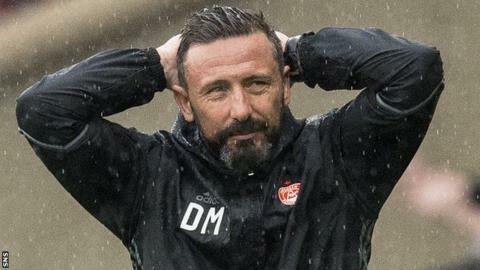 McInnes, 45, replaced Brown as Aberdeen boss in 2013, winning the League Cup final the following year, the Dons' first silverware in 19 years. In 2015, he and assistant Tony Docherty signed new contracts until 2019, and the club says the duo will now stay until at least that summer. "Everyone I have spoken to are delighted that Derek and Tony are staying and the impact will be considerable," former Scotland manager Brown added. "It looked to be a surprise, but I think that Derek would look to weigh up all the circumstances. "I'm sure he sees, and he has stated, that there is unfinished work at Aberdeen. "The big attraction to remain at Aberdeen would be the fact that he is almost guaranteed European football every year. "And I guess it will be a while before Sunderland approach European football." Aberdeen have finished second to Celtic in the Scottish Premiership for the past three years and were also runners-up to Brendan Rodgers' side in the Scottish Cup and League Cup last season.